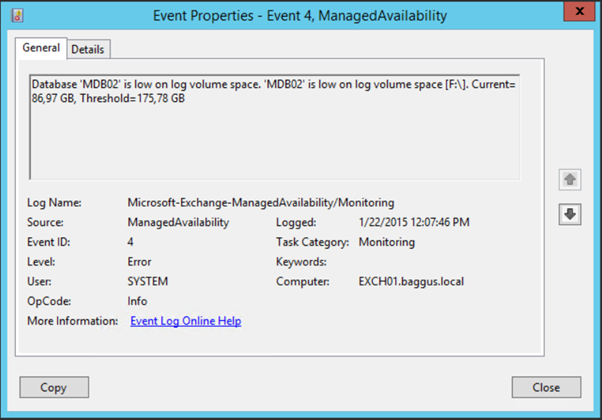 Application and Services | Microsoft | Exchange | Managed Availability | Monitoring crimson channel in the eventlog. The threshold for this is set to 175GB, and especially for lab environment this can be too low. Which will return all monitors in this healthset. Clearly visible are two Unhealthy monitors. Using a pipe and selecting only the Identity and Alertvalue shows the proper name of the monitor. We can change this behaviour by creating a monitor override that sets the threshold to 10 GB. For a normal Global Override you can use the –Duration option, which determines how long the threshold will override. This value can be between 0 and 60 days. If you want to change this permanently you can use the –ApplyVersion option. This value here in the version of Exchange that can be retrieved using the Get-ExchangeServer | Select AdminDisplayVersion cmdlet in Exchange Management Shell. After restarting the Health Manager service on both Exchange server (I have two multi-role in a DAG) the MailboxSpace health set reports ‘healthy’. Get-ServerHealth is only available in on-premise Exchange 2016…. That’s right, but this article is about on-premises Exchange, so what’s your point?